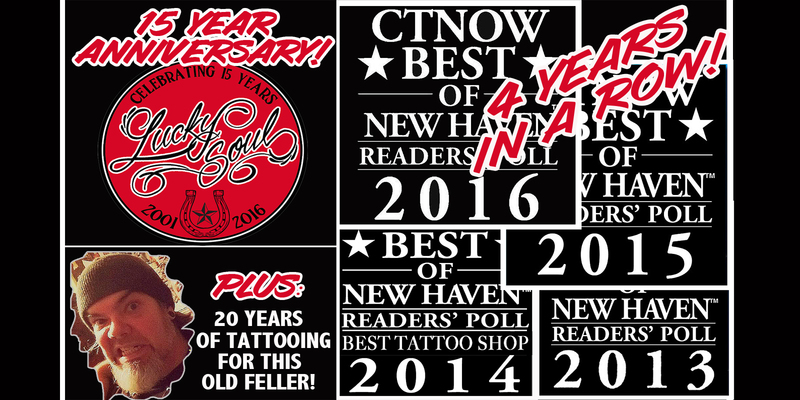 LUCKY SOUL TATTOO voted Best Of New Haven – Best Tattoo Studio – again in 2016! – Our FOURTH CONSECUTIVE BEST OF WIN! – And, Jim’s 20 year tattoo-iversary! 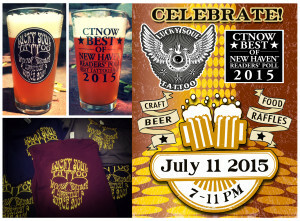 As always, our limited run of special-for-the-occasion pint glasses are $10 each, which includes 3 raffle tickets and free refills of some delicious local microbrew’s – this year we have TWO great local brewers, our fan favorite Ed Silva of Lasting Brass as well as Bill Steinbacher of Steiny’s Brewing. We will be providing other libations as well as finger foods, provided by GG’s of Milford, for free! Plus, this year we also have added the acoustic musical stylings of Dan & Jay. The raffle, as always, will include original artwork, tattoo gift certificates and other fun items as well – it is not to be missed! Fun time : All night long! 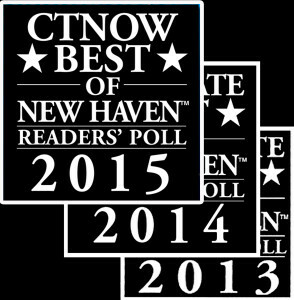 We are so grateful to everyone who voted for us as BEST OF NEW HAVEN 2016, humbled by our loyal clientele who keep us busy working and our extended tattoo family for helping us feel so loved! 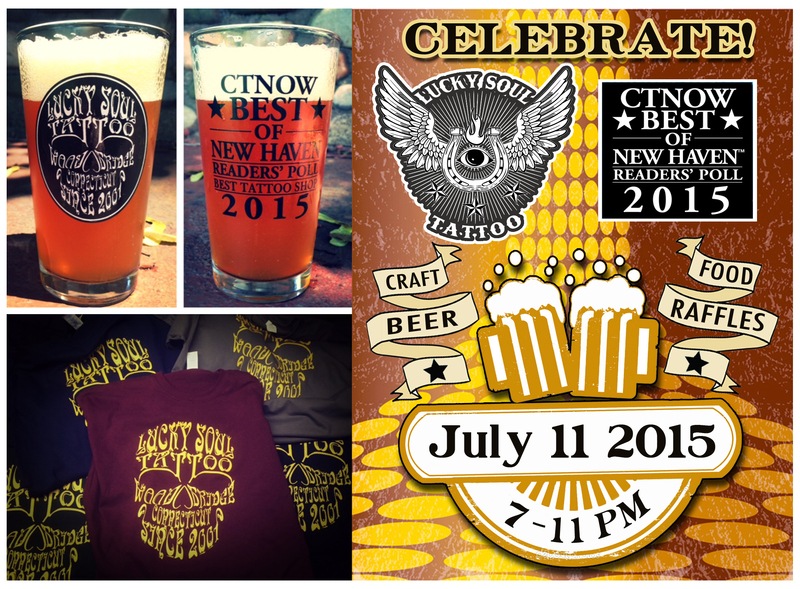 We hope to see everyone Saturday night to celebrate and to give us a chance to say THANK YOU! 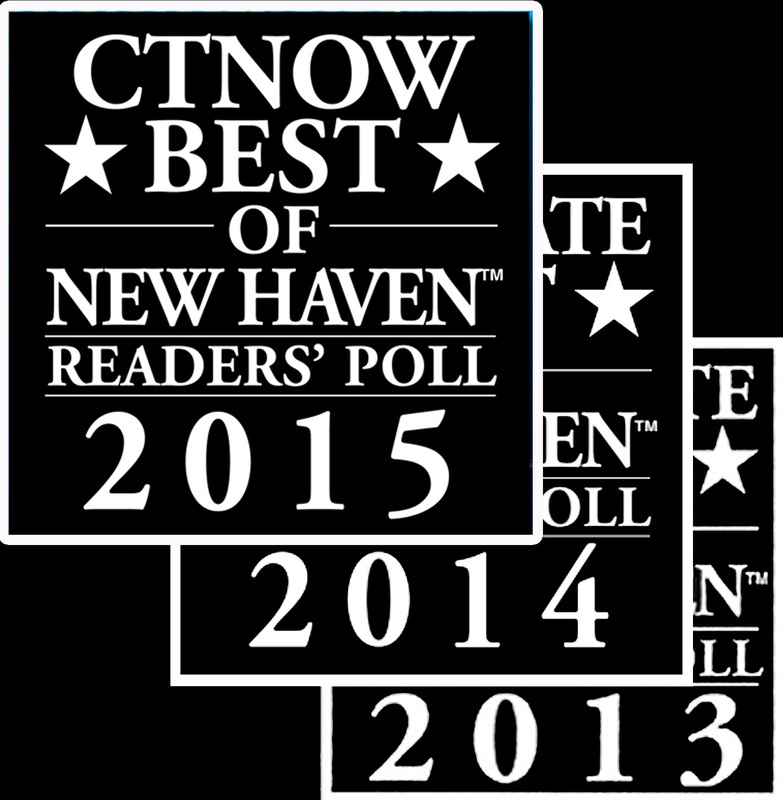 LUCKY SOUL TATTOO voted BEST TATTOO STUDIO IN NEW HAVEN COUNTY 2015! 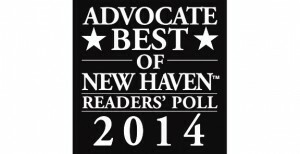 We were voted BEST OF NEW HAVEN once again! Thank you to all of our loyal clients, family, friends and fans! This is the third consecutive year in a row that we have won FIRST PLACE and we couldn’t be more excited about it, or more appreciative! This years party was special not only because it was a celebration of our third consecutive Best Of New Haven win, but also because all of the proceeds will go to help our friend Dee who is currently fighting brain cancer. So an even bigger THANK YOU to all for coming out to help support a friend in her time of need. To be able to help a friend or family in need is a true measure of success, so thank you, thank you, THANK YOU! We’ve said it before and we will say it over and over – we really have the best supporters, clients, friends and family. New and old, you guys rock! 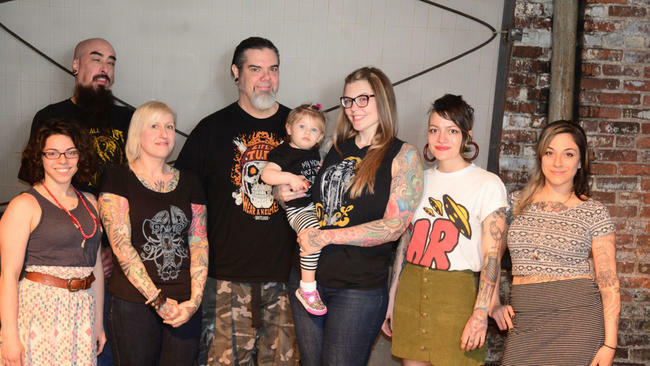 Tracey was lucky enough to have been interviewed a while ago by the wonderful local photographer (and friend) Liz Frias for her blog series on the Creative Natives of New Haven! 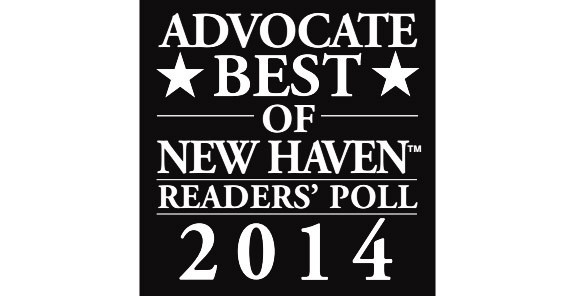 We are very proud to announce that LUCKY SOUL TATTOO has been voted BEST OF NEW HAVEN once again! We would like to thank all of our loyal clientele and friends for voting us #1 year after year! We are so humbled by the love and dedication that you all show to the crew here at LST, it is because of you that we can do what we do! And for that we are so very grateful. Keep an eye out for more info about our celebratory party coming later this summer! 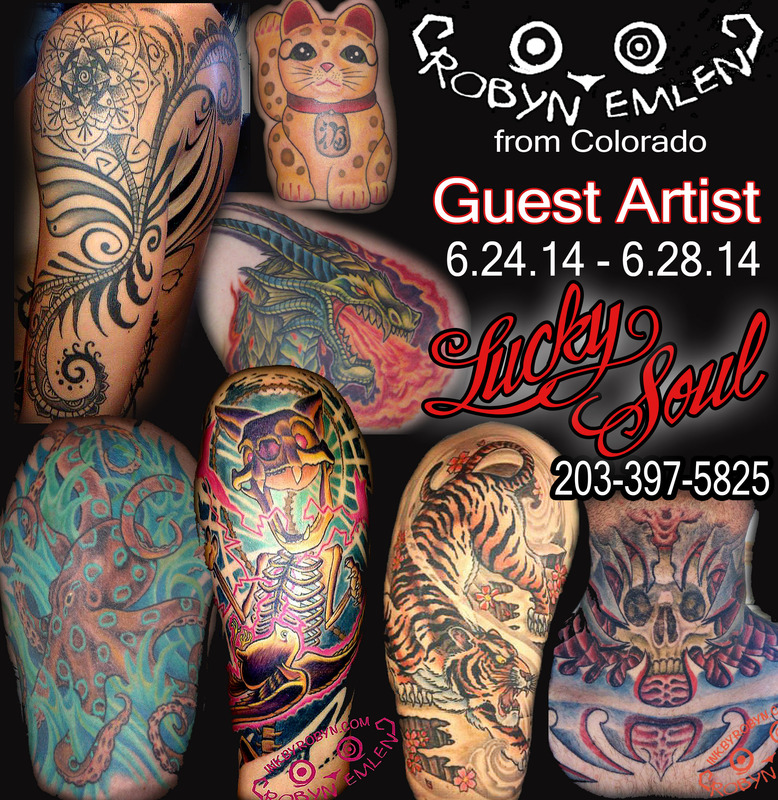 Robyn Emlen, from Colorado, will be visiting Lucky Soul Tattoo for a week in June! 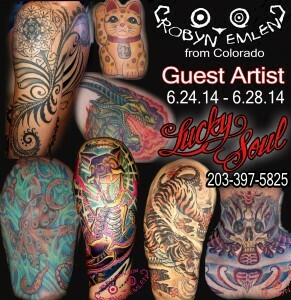 We are very excited to host this talented artist, get in touch soon to book an appointment before they are all gone! As many of you know, LST gets very busy especially in the warmer months, so this is your chance to collect that sweet summertime tattoo before its too late! Announcing February 2014 guest artists! We are happy to announce that we have TWO guest artists coming in February 2014! Once again our friend Beth Potter, from Hobo’s Tattoo in Portsmouth New Hampshire, will be joining the crew here at Lucky Soul from February 5-8, and Mike Wheeler will be back again February 18-20. Not only is this a great opportunity to collect work from artists who don’t come around this way often, but this is also a great chance for those of you who have that new piece in mind but don’t always want to wait the occasional 2-4 months to get in the books here at Lucky Soul. We anticipate Beth and Mike both will be busy here at LST, so get in touch soon for more information and to book an appointment! We are happy to announce that our friend Beth Potter, from Hobo’s Tattoo in Portsmouth New Hampshire, will be joining the crew here at Lucky Soul from October 23-26th. Beth is not only a highly skilled artist, but also a wonderful person. For those of you who know us well, you know the kind of folks we roll with, and Beth fits the Lucky Soul vibe to a ‘T’! Gracious, kind, fun and talented! WHOOP! Not only is this a great opportunity to collect work from an artist who doesn’t come around this way often, but this is also a great chance for those of you who have that new piece in mind but don’t always want to wait the occasional 2-4 months to get in the books here at Lucky Soul. We anticipate Beth will be busy here at LST, so get in touch soon for more information and to book an appointment! Stewart has flown the coop! We are sad to officially announce that our young Stewart has left Connecticut to head back to the shores of NorCal. We were very lucky souls indeed to have the chance to work alongside such a wonderful young man and talented artist. 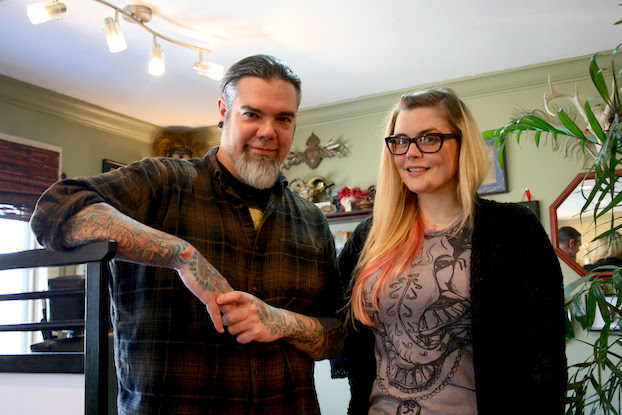 Stewart is truly a gem, and if you got tattooed by him while he was here you know what we mean! If you didn’t have a chance to get any work done by the man/myth/legend Daniel Stewart, or if you have any existing work that needs finishing up, we are happy to say that we expect him back at the shop a few times a year (hopefully!). Stewart always has a home here at Lucky Soul, and we hope to welcome him as often as we can. Keep an eye on our Lucky Soul facebook page for more information on his triumphant return! Sweet NEW Merch from LST! Express your personal style while repping your favorite shop! Grab a rad pullover hoodie or t-shirt featuring brand new designs by Jim and Tracey. Available in our shop or our online store.